Born on 25 November 1885 in Bay City, Michigan - son of George James Sinclair, Detroit, Michigan - at the time of his enlistment in 1916: present address in Fort William, Ontario; trade as railroad switchman; single; no current or previous military service; Presbyterian; height of 5 feet 5.5 inches; chest of 37 inches fully expanded; fair complexion; gray eyes; black hair. 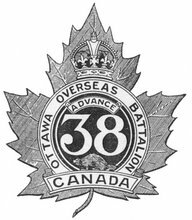 Joined the 97th Battalion, CEF, in Fort William, Ontario, on 2 March 1916 (number 261017) - taken on the strength of the 38th Battalion, CEF, on 12 or 13 February 1917 - killed in action on 9 April 1917 - name inscribed on the Vimy Memorial, France. (Updated with a photo of Sgt Sinclair's inscription on the Vimy Memorial that I took in August 2012).